Women prisoners in Colombia face poor medical care and hygiene conditions, overcrowding, harassment by male guards, mistreatment and abuses at the hands of staff, and lack of privacy during conjugal visits, according to complaints filed with state oversight agencies. In addition, they are often transferred to prisons far from their homes and families. The same kinds of abuses are faced by women inmates whether they are common prisoners or political prisoners in this civil war-torn country, human rights organisations report. To address the situation, the CSPP and other local human rights groups are organising a campaign for the Rights and Dignity of Women Prisoners in Colombia, to be launched in June. 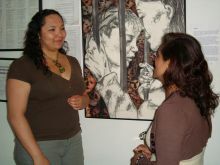 The campaign is aimed at drawing national and international attention to the situation of women in Colombia’s prisons. In this South American country of 45 million people, an estimated 76,500 people are in jail, including 4,830 women, or 6.3 percent of the prison population. The figures are approximate, because the National Penitentiary Institute does not provide precise numbers, Sánchez said. “Falsos judiciales” is a term referring to trumped-up cases that lead to arbitrary arrests used by the government to exaggerate the success of its hard-line counterinsurgency tactics against the leftist guerrillas. María, who asked not to be identified, is a case in point. She told IPS that early one morning in April 2005, armed men ransacked her home and arrested her, while seizing the only “suspicious” thing they found: her students’ homework. María is a teacher, a former trade unionist, and a supporter of the left-wing Alternative Democratic Pole party. “But I have never been a guerrilla,” she said emphatically. After spending 13 days in a cell at the Departamento Administrativo de Seguridad — Colombia’s domestic intelligence agency — she was transferred to a prison in Bogotá, accused of “rebellion” against the state and “terrorism” — charges often faced in Colombia by labour, social, student and human rights activists. “I’m a teacher, not a guerrilla,” she told the court over and over again. Like 33 percent of the prison population in Colombia, María was held in preventive detention without bail. She spent a total of 19 months behind bars before she was released without any explanation or apology. “It was all so absurd,” she said. She is now waiting for a settlement hearing with government officials before deciding whether to sue. Jiménez and Sánchez talked about the problem of overcrowding in prisons that hold, on average, twice the number of inmates for which they were designed — or in some cases, many times more. “Seven people are squashed into a cell for two, and there are no facilities for studying or working, which means there is no rehabilitation,” Sánchez said. In 1998, the Constitutional Court declared overcrowding in prisons unconstitutional, which prompted the construction of new penal facilities, built in line with U.S. specifications. In addition, the number of women transferred to prisons far from their homes, and their children, has increased, “causing deep depression and suicide attempts, like what happened last year in the prison in Valledupar,” in northeast Colombia, Jiménez added. “That separation is the most painful thing,” María said. The youngest of her two children was nine years old, and María still cries when she remembers how hard their visits were, and how difficult it was to be so far away. “It was heart-wrenching. I can’t forget the sight of a 24-year-old woman whose little children would be brought to her, and they would cling so tightly to her legs that the guard had to peel them off when the visit ended,” she said. In Colombia, children can stay with their mothers in prison until they turn three. After that, they are handed over to the family, or to the government Family Welfare Institute (ICBF) if there are no relatives who can take them in. The ICBF can place them in foster homes. “It is the children, the innocent ones, who are the most disregarded by the state. It’s hard to conceive why many women in for lesser crimes are denied house arrest when white collar criminals serve their sentences at their country houses,” María said. Another problem is the prison system’s refusal to allow women, even those who are in prison for decades, to have conjugal visits with anyone but the partner they initially named at the start of their sentence. “They have the additional penalty of having to have sexual relations with the person they registered or with no one,” Sánchez said. She said that in contrast to women, who normally continue to visit and support their imprisoned husbands for years, men often visit three or four times and stop going. Prisoners who dare to protest or speak out about abuses or poor conditions are often beaten or punished by means of a transfer to a facility that is even more distant from their homes or where conditions are worse. Jiménez and Sánchez also mentioned the elimination of the ban on male guards in women’s prisons, which has given rise to cases of sexual harassment and abuse. Another problem is that since 2008, medical care in prisons has been in the hands of a public health care provider that is facing bankruptcy. The campaign for the rights of women prisoners will seek solutions to all of these problems.